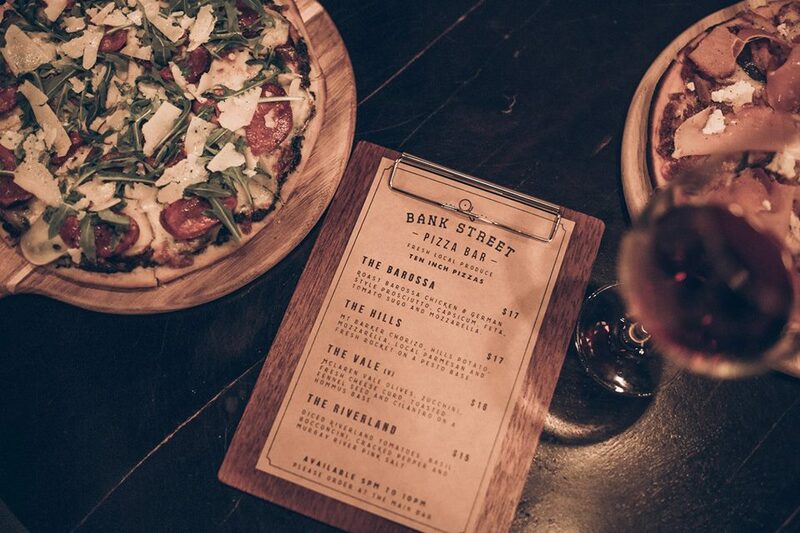 Bank Street Social’s Pizza Bar is open from 5pm-10pm, Tuesday through Saturday, serving up freshly made stone-cooked pizza in Adelaide’s West End. With 100% locally-sourced ingredients, each pizza features regionally-inspired flavours from some of South Australia’s best gourmet food suppliers. All dough and sauces are made fresh and in-house by our pizza chef. Soy-braised duck with five spice, ginger, onion, slaw & kewpie. Spicy Barossa pepperoni, fresh chilli, parmesan, tomato and mozzarella. Hahndorf chorizo, parmesan, roast potato, fresh rocket & pesto. Diced Riverland tomatoes, basil, bocconcini, cracked pepper and Murray River pink salt. The Margherita is vegetarian, with vegan pizza available on request. GF pizza bases are available – surcharge applies. Spice up the middle of your week. All pizzas on the menu just $15 every Wednesday night.